Mary Nolan Hickey has raised over €36,000 by often running more than a marathon each day. Mary Nolan Hickey set out from her Co. Wicklow home on New Year's Day. ON NEW YEAR’S Day, Mary Nolan Hickey set out to run the entire coast of Ireland for the Irish RNLI. Now, having raised more than €36,000, the 65-year-old is gearing up for her homecoming. Over three months after leaving her home in Arklow, Co Wicklow, Hickey will return home to the town’s main street on Saturday, where friends, family, supporters and the local lifeboat crew will be ready to celebrate as she completes her campaign, called ‘Lap of the Map’. Once I started, there was no other thought in my mind other than ‘I will get this done.’ I could think of no better organisation to do this for. She decided to make her anti-clockwise journey around the country during the winter, deliberately facing rough weather that symbolises the stormy conditions that RNLI crews often work through. Even with the Beast from the East and Storm Emma hitting this year, Hickey was determined to keep running. When she started, Hickey said that she would be very happy to reach €20,000. But now the campaign has exceeded €36,000, and the numbers are still growing as people continue to donate. And the kindness of people across Ireland has exceeded her expectations too. She did some fundraising before she started, expecting to stay in cheap hostels. Instead, she’s been taken into homes, B&Bs and hotels. She left with two people helping her, and that grew to nine within just four days. They would contact the towns in advance of her arrival, and locals would take her in. “I never had to worry about accommodation,” she says. At every stop, a crowd would wait to meet her. In every one of the over 40 lifeboat stations she has visited, the volunteers would greet her with cheers, sweets and biscuits. In every town, someone would offer to carry her bags to the next location. Hickey leaves Kilmuckridge today, her last day before her homecoming. She says she’s “excited” to return home, to her business, which she left in the hands of her son, and her family and pets. Email “This 65-year-old has spent 2018 running the coast of Ireland for the RNLI - and is about to return home”. 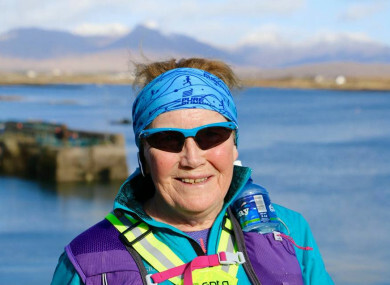 Feedback on “This 65-year-old has spent 2018 running the coast of Ireland for the RNLI - and is about to return home”.